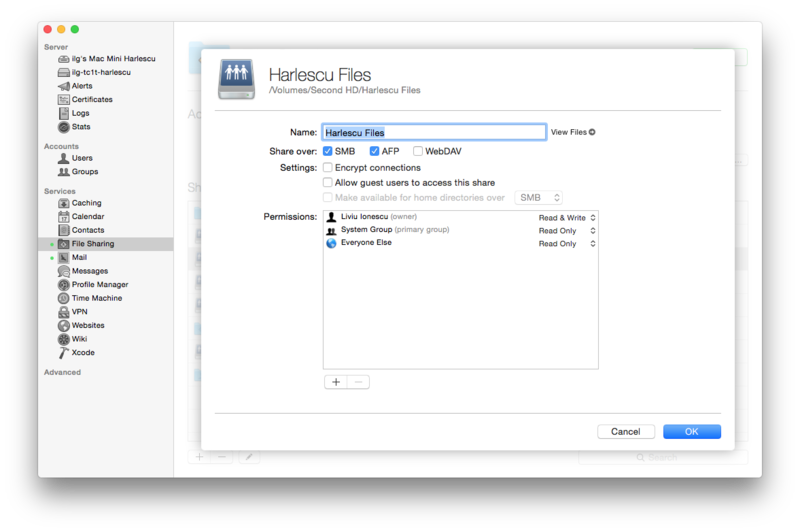 ← OS X: How to change an alias icon? I recently reactivated my backup Mac Mini as a server; for convenience, I installed the OS X Server package. After fiddling a bit with the interface, I decided I actually need only two services, the File Sharing and Mail. The file sharing configuration is straightforward. Given the very consumerist direction Apple is heading, I wasn’t very surprised to discover it does not provide any support for NFS (needed to access the calibre library, see the How to use calibre with a network drive? With NFS! post). Fortunately, the NFS server configuration is not very complicated, and can be set by editing one single file, /etc/exports. The first path is the folder to export; the optional address restricts access only to this host (more complex expressions are allowed, see the nfsd manual page). The above configuration seemed to be the kind perform and forget, it worked from the first attempt and did not require further changes.